By 2010, there were 1.5 billion people in the world without electricity, 800 million people without access to water, 2500 without access health services, resulting in 800 infant mortalities per day. States and global organizations have a problem that urgently need a solution. Wilefko is an opportunity to mitigate the lack of energy available to coastline populations worldwide. The availability of global ocean energy is estimated to be 28,000 TWh / year, estimations indicate profitable points for installation that meet the minimum return required for the project. Electricity Generation: income from sale and installation of isolated equipment on the waterfront to power small communities. Client: the state through its municipalities and Regional Government. Seawater desalination: using reverse osmosis filtera, attached to our device pumping seawater, based on our engine powered by our technology wave paddle. Revenues from the sale and installation of equipment isolated on the waterfront, capable of delivering up to 220 cubic meters per day (m3 / day) of fresh water obtained from each wave train. This solution is designed for small communities, with the state acquires the customer for these isolated communities, through municipalities and the Regional Government. Lighting of coastline: to provide electricity to 67 poles of 180W each, which in total, illuminate appoximately an area of 1,500 meters in length, each wave train used to capture the energy of the sea. Incomes are generated by the sale and installation of insulated equipment, purchased by municipalities and companies located on the waterfront, with the possibility of injecting the surplus to the grid by NetBilling contracts. Compressed air supply or for industrial processes: income from the sale and installation of insulated equipment, used for supplying compressed air to industrial processes. Aimed at customers operating in ports and companies operating on the waterfront. Energy sales business and long-term power, with an installed capacity from 3 MW. In this business model, the concept is oriented for generating companies that need to comply with a share of NCRE generation, as defined in the law 20/25. One can also apply as a medium to large enterprise requiring overnight supply from a renewable energy source, referred as free clients. Sale of electricity at spot price. Sale of electric power, a power node price. Sale of energy PPA Power. Sale of carbon credits associated with CDM. Income from the reduction of CO2 emissions attributable to the office of the NCRE and efficient co-generation technology. Credit Sale URE (if the energy source is URE). Contribution to NCRE Law. Oriented to generation companies or investment funds interested in investing in new sources of renewable energy. Divest part or all of the rights to use the technology in countries other than Chile. This business model is aimed at potential developers, utilities, states or investment funds interested in commercially exploiting the technology, specially designed for use in the United States, Canada, Australia and the European Union, these are relevant markets and are where we have protection patent and commercial rights. Sale of industrial patent rights. AXIS No. 1: Development of isolated systems. We will operate on this axis, as a B-corporation, which seeks to meet the needs of water and electricity for isolated areas or islands of Chile. 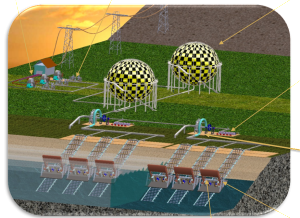 Development of pilot plants for mining, in order to explore the feasibility of obtaining energy NCRE for Chile’s main industry. Construction 1-3 MW, maturity stage for large projects. Release for construction of plants using our technology hub that can develop in parallel with the other 2 axes: strategic or development.